Canada Security installs and services Access Control Systems for High Rise Residential and Commercial buildings. Our technicians have been trained and certified to install many of the major "non-proprietary" access control systems. Our installations require us to install computer software, card readers (including Proximity, Bio-metric and RF Technology), Electric Door Strikes, Magnetic Door Locks, Door Contacts, conduit and cabling. We set up each access system with Access Schedules and Profiles for Employees, Residents and Visitors to ensure effective access control. As a leading manufacturer of door entry systems, Cansec provides security for your entrances along with the scalability to expand. 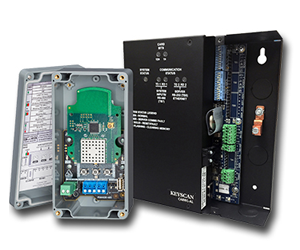 Complete systems come with electric strike, power supply, software, proximity cards and readers, door contacts. 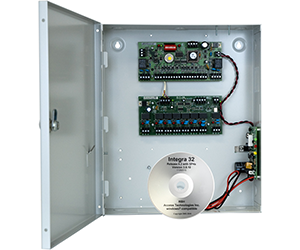 The IRC-2000 Intelligent Controller allows control of two access control points (doors). It utilizes flash firmware for easy upgrades, and employs fully distributed intelligence for off-line operations. It includes the Integra32 Management System, the controller.